VANCOUVER – This was not how the Buffalo Sabres wanted to enter a long break. More poor defensive play resulted in a 4-3 loss to the Vancouver Canucks in Rogers Arena on Friday night, ending a three-game western Canada road trip. Canucks rookie goalie Thatcher Demko stole the game with his 16 third-period saves to withstand a late blitz. That was no consolation for the Sabres. Now, they will not practice again until Sunday, Jan. 27, and won’t play another game until two days later in Columbus because of a bye week and the All-Star Game. It is a reprieve from the rigorous NHL schedule, but neither the players nor the coaches plan to rest too easy. The Sabres, now four points back of Pittsburgh for the second wild-card playoff spot, dropped two of three games in western Canada, beginning with a 7-2 loss in Edmonton on Monday. They allowed 14 goals during the trip and failed to build off a 4-3 overtime win over Calgary on Wednesday. There is a catch to receiving a little time off: most of the Eastern Conference will play games prior to the All-Star break next weekend. Boston, Pittsburgh and Tampa Bay are the few exceptions. Of course, each team must receive those mandatory five days without practice at some point in the season, so there will be an opportunity to gain ground later in the season. But the Sabres’ playoff deficit could grow between now and when the puck drops against the Blue Jackets. Buffalo will have only two practices and a morning skate to prepare. There is much to correct, as the Sabres showed again Friday against the Canucks. Though Housley’s team allowed only 23 shots on goal, goalie Linus Ullmark received little help from his teammates and bad plays resulted in Vancouver goals. Entering Saturday’s games, the Sabres were tied for 20th in goals and ranked 20th in the NHL in goals allowed. Secondary scoring has come and gone – Evan Rodrigues had three goals during the road trip – but their defensive play is the greater concern. The Sabres allowed too many odd-man rushes and quality scoring chances during the 10-game winning streak, but goaltending and puck luck were on their side. Seemingly all of their mistakes have turned into goals as of late. Housley and the coaching staff plan to return to Buffalo early to get back to work. While Jack Eichel and Jeff Skinner head to San Jose for the All-Star Game, their teammates will physically prepare for the season’s final 34 games. The Sabres, 24-18-6, have only seven wins in their last 23 games, tied for the NHL’s second-worst record during that span. When asked how he can fix the Sabres’ defensive woes, Housley said the only solution is to practice. That won’t be possible for the next week. The NHL installed the bye weeks in 2016-17 to give teams added rest during a rigorous schedule, but time off has often resulted in poor play across the league. The Sabres lost each of their first two games following the bye last season, including a 7-1 meltdown against Dallas on Jan. 20. Players don’t plan to take the entire week to relax. Housley has stressed the importance of maintenance and building strength to prevent injuries. The disappointment from losing to the Canucks will likely linger with them during the break. That much was obvious in the visitors’ locker room in Rogers Arena. 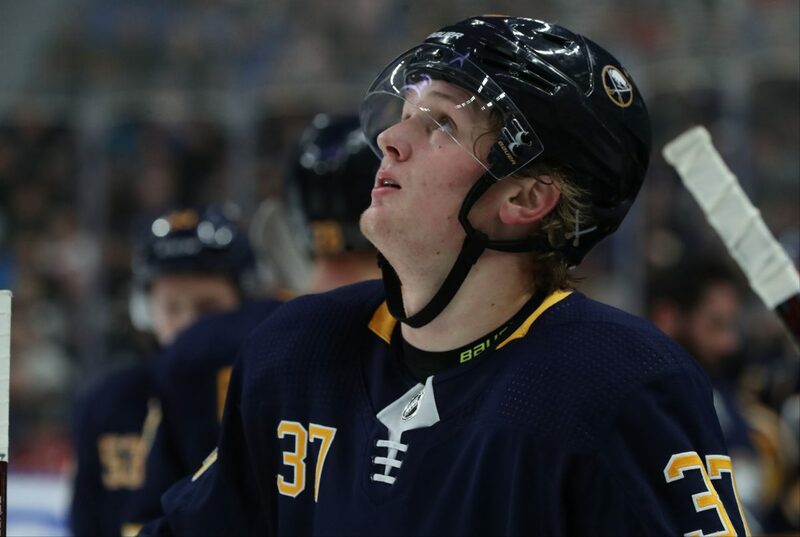 Though the Sabres played well enough offensively to win, they again let two points to slip away and are running out of time to find a solution.